2. 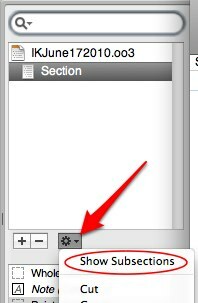 Sections are showing up in the Utilities panel but what about sub-sections? I'w found a image on the Omni pages where it is shown - but I cannot figure out how? Click the process wheel (which contains shortcuts for commonly used actions) at the lower edge of the panel. Last edited by RobTrew; 2010-06-25 at 02:16 AM..